Earlier this summer I stood on the rooftop of the McCormick Place convention center along Chicago’s lakefront and looked around. In front of me were vast rectangular trays of a monoculture of low yellow sedum and bare soil. What I saw in my mind’s eye was bed after garden bed bursting with kale, collards, carrots, radishes, lettuces, peppers, beans, beets, tomatoes, and herbs. For in that space, as part of the Chicago Botanic Garden’s ongoing mission to promote sustainable gardening and to train Chicago residents for jobs in urban agriculture and green industries, we had just launched the largest farm-to-fork rooftop garden in the Midwest. In partnership with SAVOR…Chicago, the food service provider for McCormick Place, the Garden has created a 20,000-square-foot rooftop enterprise that will likely yield about 4,000 pounds of produce this year—its first—and double or triple that amount in subsequent years. Already, we are well on our way to that first half-season harvest. Within this enormous rooftop garden we will expand our urban agriculture capabilities, create more hands-on training and job opportunities for our Windy City Harvest participants, and serve as a local source of fresh produce to this major international convention center. Later this summer, we expect the first of what will be many harvests in years to come—and many lives changed for the better. 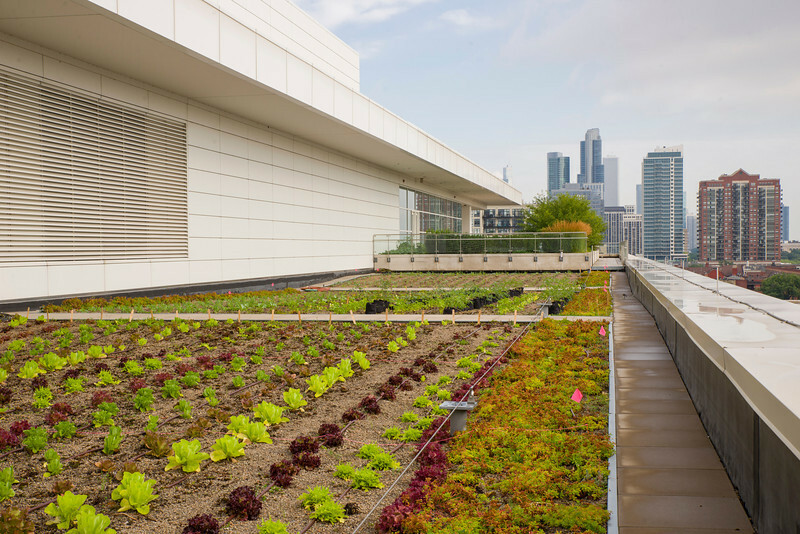 The McCormick Place rooftop garden was designed and planted by Angela Mason, the Garden’s director of urban agriculture, and staff from our Windy City Harvest program, which offers the state’s first accredited urban agriculture certificate. Over the past five years, Windy City Harvest has planted and maintained five acres of vegetable gardens at six Chicago locations. 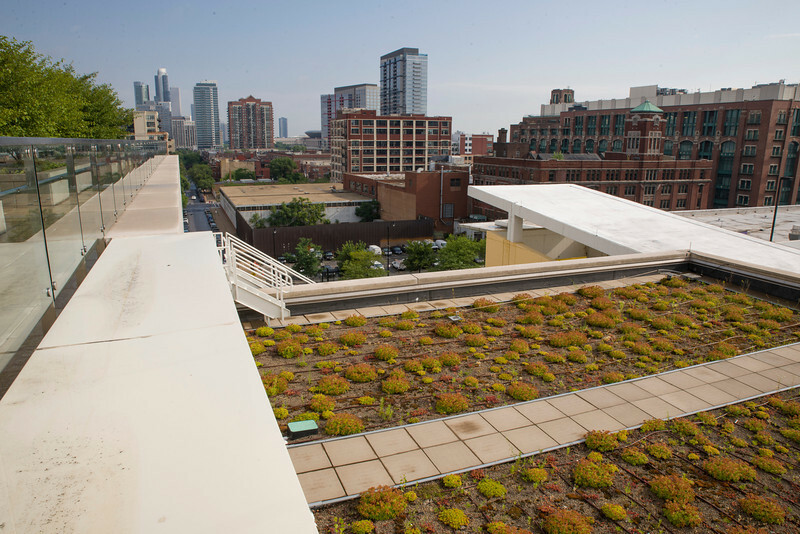 This newest rooftop garden, like the other sites, will become one of the program’s living laboratories, offering hands-on experience to Windy City Harvest students. As I lingered on the rooftop that day, contemplating the garden-to-be in front of me amid the magnificent expanse of Chicago, I felt acutely my place as one of many people, within the Garden and well beyond, committed to the idea of making the world a better place, one step—or one garden bed—at a time. 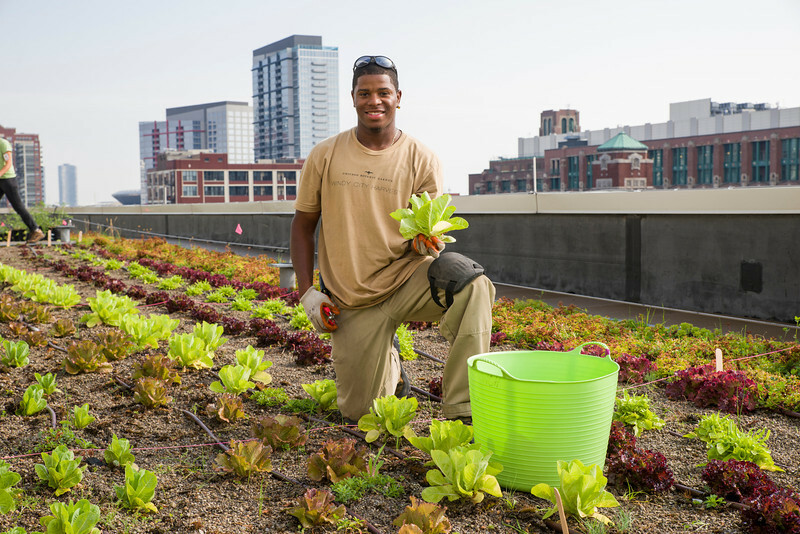 Read more about the Chicago Botanic Garden’s urban agriculture programs. What a terrific use of space ! No rodents or other 4 legged critters to destroy the garden. Add some rain barrels ( didn’t read anything about that ) and some potted trees so your gardeners can have a small oasis of shade to take break. Kudos o the fine green work you all are doing as well as the teaching.